Shattuck St. Mary’s Prep forward Chase Phelps has committed to BU for 2014, and becomes the third new recruit in the past week. The 6’0” 180 left wing, a teammate of 2016 recruit Clayton Keller, has a 6-15-21 line in 18 games for the Sabres. 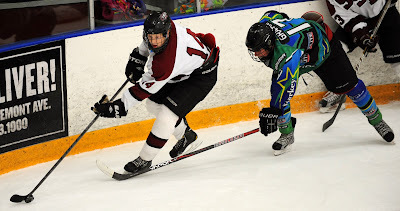 Last season he scored 60 points (23g, 37a) for SSM Prep and after a strong performance at the Select 17s, he earned a spot on USA Hockey's Select U18 squad for the Ivan Hlinka tournament this past summer. The Edina, Minn., native joins Jack Eichel (NTDP 18s) and J.J. Piccinich (Youngstown) as forward in the 2014 recruit class. Good-sized forward contributes in every facet of the game and can toy with defenders in the offensive zone. Plays a style of game that will translate extremely well to college hockey and doesn’t over-complicate things, plugging away on the offense with a number of tools at his disposal. Hit a point-per-game pace as a junior on prep last year and looks to eclipse that this season. Phelps is a taller forward, standing roughly 6'1" 180 lbs, though he tends to play more of a skill game that relying on brute physicality. A heavy snap shot with a quick release makes him a dangerous scoring threat from many areas of the ice, and his high assist totals show an ability to use his teammates effectively as well. NHL Central Scouting gave Phelps a 'C' rating in their preliminary rankings, though it seems highly likely that Phelps will rise up draft boards after a strong start to the season. 4. Chase Phelps, F, ’96 (Shattuck-St. Mary’s) — Big, strong forward with a heavy shot and a soft set of hands. Edina, Minn. native finished 3rd in team scoring with a 23-37-60 scoring line in 57 games played. Has upside and will get better as he continues to fill into his wide frame. A versatile player, Phelps could play a number of roles at the higher levels. ► Episode 6 of Inside BU Hockey features Bernie Corbett’s interviews with Head Coach David Quinn, senior Matt Ronan and BU athletic director Mike Lynch, who discusses the upcoming Red Hot Hockey IV at refurbished Madison Square Garden on October 30. Longtime Hockey News writer and public address announcer at BC’s Conte Forum Tom Burke has covered college hockey since 1969. He recently spoke with legendary Terrier Hockey Coach Jack Kelley to discuss college hockey’s best rivalry. A former All-East defenseman at BU who played on two Final Four squads, Kelley’s one-decade tenure as Terrier coach was short—compared to Jack Parker’s 40 seasons or BC’s Snooks Kelley’s 36—but the numbers are stellar: 206-80-8 for a .716 win percentage, six Beanpot titles, one Hockey East title, four Final Four appearances and back-to-back national titles in 1971 and 1972. During his ten seasons, the rivalry between BU and BC---and Jack vs. Snooks—was tilted back in the Terriers' direction, with BU winning 17 of 25 games, including seven of the last eight. ► With bullying at schools and in sports making headlines, former BU All-American and Nashville Predators center Colin Wilson has been bringing an anti-bullying message to school kids in Tennessee and his hometown, Winnipeg.